When many people think of Charleston, South Carolina, visions of brightly colored traditional row houses come to mind, as well as scenic beaches and palmetto trees. 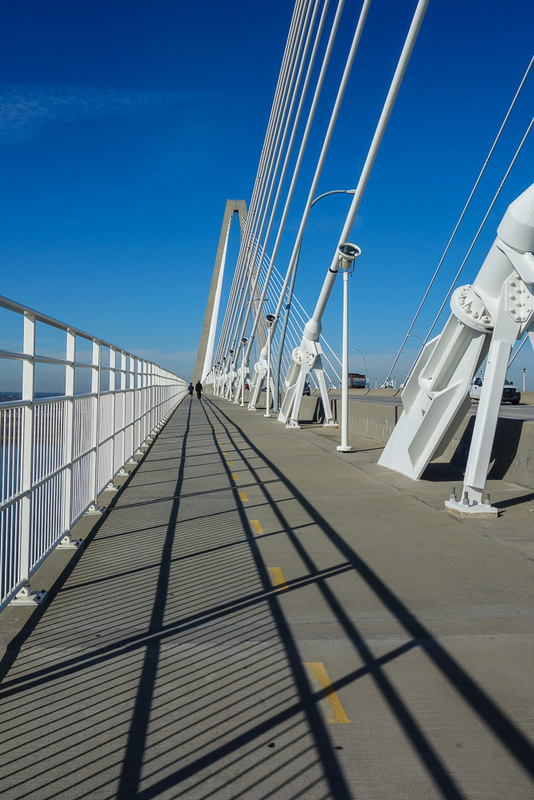 One of my favorite places there, however, is more modern: the Arthur Ravenel Jr., Bridge that spans the Cooper River and connects Charleston to Mt. Pleasant. Walking across the bridge, finished in 2005, makes for a great work-out, especially after partaking in the area’s famous cuisine (as well as my mother’s excellent cooking!). I try to walk the bridge as often as possible on my visits, and if I go all the way across and back, it’s a 2 1/2-mile work-out on a moderate incline that, if nothing else, enables me to combine a bit of fitness with photography. On this walk I carried my Sony RX100 in my pocket and enjoyed photographing the bridge as well as Patriot’s Point and downtown Charleston from the apex, where you overlook Charleston Harbor and the Atlantic Ocean. It’s a view that’s well worth effort, and, if you want an even better experience, make sure to pack your iPod to eliminate the noise from the passing vehicles! That needs to be in a photography show in Charleston!!! Thanks Lucinda! I always enjoy photographing that bridge. There are so many different perspectives, and I find something new each time. I agree with lucindadenton,… and on a magazine cover. Thanks so much, Amy! Wouldn’t that be fun!